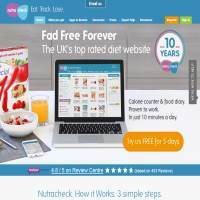 NutraCheck is a UK-based website designed to help you control what you eat using tracking and monitoring tools. It provides apps for phones and tablets, plus links to your fitbit. Aside from the recipes and additional information available on the site’s library, this diet site is primarily useful for tracking your nutritional intake (which is to say, checking out what’s in the food you eat). You can also log up to eight different measurements (your weight being one) to find out whether you’re really making any progress. The tracking tools are slightly more sophisticated than many sites offer, since you can track several key measurements, rather than just your weight (which can vary a lot depending on whether or not you’ve had something to drink, eaten, bathed, exercised and more). In turn, your results ought to be more accurate. Part of the reason for so much logging and diary keeping is that the experts claim this helps you to keep losing weight. There are a few apps available including a link to HealthKit. This iPhone app allows you to keep summaries of your calories and fat when you’re out, making it useful for when you’re eating at restaurants. You can also link your account to your fitbit (a wrist device which measures your steps) to work out how many calories you’re burning off whilst walking around. Whilst these apps are good, they’re much less developed than some we’ve seen, which you can find through some fitness and bodybuilding websites. Still, it’s nice to have the option. NutraCheck.co.uk’s library and resources are a useful feature for anyone, much of which is available for free. Finding specific answers isn’t always easy, although you can search through the data to help narrow down what you’re looking for. The calorie counter has over 160,000 foods in its databanks, including branded items such as cereals. You can see many of the items, which helps to identify exactly which version you’re eating. You can also add foods to your favourites or store recipes you enjoy. Experts are on call to help if you have any issues, which is good to see. However, we did feel that Nutra Check didn’t really offer all that much considering it’s not much cheaper than other services. If you’re just looking for a few recipes, and a quick way of tracking the nutritional value of the foods you’re eating, this ought to do the job. However, if you want more analysis tools, advice, exercise programs and tools, you may wish to explore other dieting and weight loss sites.